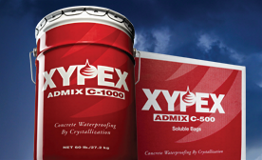 Xypex Admix is blended into the concrete mix at the time of batching to waterproof and protect concrete from the start. It outperforms other methods because of its unique ability to become a truly integral part of the concrete matrix. The Admix C-Series has been specially formulated to meet varying project and temperature conditions.